Blood oranges are so stunning and make the most amazing Blood Orange Margarita cocktail. Grab some quick before their short season is over! As I’ve done often in the past couple of months, I’m offering up a really old post as new again. This was originally published six years ago and the images were ready for a redo. I have a new camera and it’s a huge learning curve and I spent all morning on photos trying to figure some things out. I’m not quite comfortable with it yet but I’m on my way and these Blood Orange Margaritas were the perfect still life to practice on! Beyond that? This cocktail is so perfect I wanted to share again. I used to be so stuck on my favorite margarita recipe that I seldom ventured far from it. One day I decided to try changing it up with some summer fruit and the rest is history; I’ll try to make a margarita out of any seasonal fruit and right now blood oranges are in season. While there is something about that cold and icy drink that’s just perfect for having friends over during warmer months along with guacamole, chips and either fajitas or barbecue ribs, the fact that I’m making country style pork ribs in a pressure cooker today might have something to do with this update. I’ll serve this margarita and the fresh, seasonal citrus will be great with pork and a fresh slaw. Besides that? It’s SIXTY degrees outside in January; we’ll just pretend that summer is around the corner! If you’ve never had a blood orange and are wondering why it’s called that, well, now you see. Isn’t that color beautiful? The flavor is different too; they have less of a citrus bite to them and are also a bit sweeter. They are gorgeous and finding these beauties is always a real bright spot in the middle of winter. I don’t see them much at my regular grocery store but have good success at either Sprouts or Whole Foods so take a peek there if you run into the same dilemma; they are so worth it. Beyond the oranges I do think a couple of things are imperative for making really good margaritas. Use good tequila – I didn’t have my standard on hand that I use for margaritas which is Cuervo 1800; a reposado tequila meaning that it’s been aged a bit but less than one year. Not quite a high caliber sipping tequila but even a bit of aging makes for a much smoother tequila and that improvement is evident in a cocktail. All I had on hand to make this cocktail was a pricey sipping tequila. Not necessary but what a fine cocktail it made. Please don’t use cheap Triple Sec – Triple Sec is merely artificially flavored sugar water. Nuff said? I use Patron’s Citronge or Grand Marnier or any other orange liqueur made from the actual essence of orange; all are good. Fresh lime juice and obviously fresh orange juice – even if you can’t locate blood oranges and want to try this with regular oranges I don’t recommend using frozen or bottled OJ. Buy some oranges and give them a quick squeeze…besides you needs some slices for garnish right? Go now and grab some blood oranges and try this cocktail…it is now officially my ‘winter’ margarita…make it yours too! A simply gorgeous cocktail best enjoyed seasonally with fresh blood oranges. Margarita or Kosher Salt and Sugar combination (half of each) - I love the large cake decorating sugar crystals available at Michael's for the sugar but table sugar will work too. Make the simple syrup by combining water and sugar over medium high heat. Heat until sugar is dissolved; remove from heat and let cool. Combine equal parts of salt and sugar and spread on a saucer. Rub the rim of each glass with a lime wedge and then dip the edge into the salt/sugar combination. Fill glasses with ice. Combine the tequila, blood orange juice, lime juice, orange liqueur, and simple syrup in a cocktail shaker. Fill with ice and shake for approximately 30 second until ice cold. Pour mixture into the glasses. Garnish with an orange slice and lime wedge. I’m good with being the Margarita Queen…I do love them and as much, I love making them! LOVE this recipe! I have made these 3 different times lately because they are so good! My friends loved them last night! I just wish I had made more! I made them ahead of time and put in a pitcher, then just shook them in a mixer when they got here. Just saw your comment Rachel; so glad you enjoy them; I’ve been using Cara Cara oranges this season because they’ve been easier to find; they’ve been so good too! I love this recipe, definitely an ideal winter margarita. I made it today with 1800 Reposado and Patron Citronge. So smooth! Isn’t it wonderful? And you hit on the perfect ingredients; I use 1800 for all of my margaritas and Patron is my orange liqueur of choice too. So pretty isn’t it? I love the idea of using blood oranges. Is high quality tequila necessary? I wasn’t sure if reposado was recommended specifically because of the blood oranges or just to increase the quality of the cocktail. Well…for me it is. It was an eye opening moment the first time I used reposado in a margarita; went from hating them to loving them. I don’t use super pricey stuff but not ‘gold’ either. Is there a particular brand you would recommend? I typically use 1800 Brand Reposado; not expensive but so much smoother without that bitter bite of cheap tequila. Great pictures and recipe! 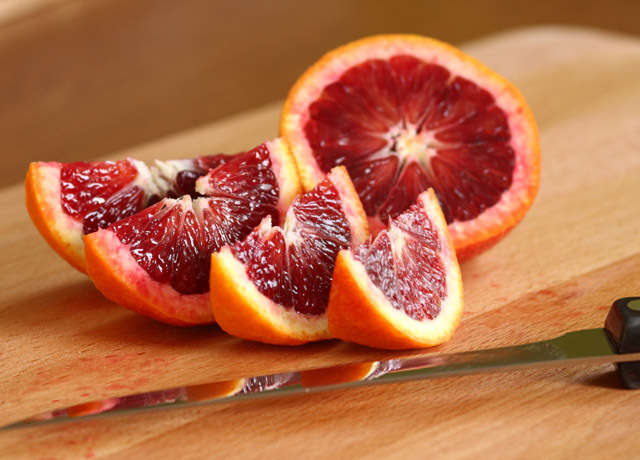 I showcase different seasonal fruits each week on my health blog and this week is the blood orange. Could I use your picture and recipe as the feature for a Cinco de Mayo special with full credit to you? Thank you Kasey…and certainly. I LOVE this cocktail…sadly no more blood oranges in Denver; I’m going to have to find something similar to make one that I love as much. Can I link you and use this picture for a special gourmet round up I’m doing for the Hunger Games? Full credit of course. Certainly…that would be fine Angela. My original recipe for margaritas does have that requirement but then it is the rind and the juice of the lemons and limes mixed with the tequila that seems to make that drink so good. This one Callye; I might be drinking it moments after putting those ingredients together. You HAVE to find some of those oranges…this is a new favorite for sure. “Here, here’ on no Triple Sec. Since using Citronage I’ll never go back. This looks so refreshing. I made a very similar Grapefruit Margarita recently that was just right for this time of year. This might be my new favorite margarita. The flavor is fantastic but it’s that luscious color that wins the prize. Stunning!! I love the color. I don’t blame you for not wanting to sip margaritas in the winter. I live in the Rio Grande Valley Texas so our winters are still in the 70’s..so I sip margaritas all year round. Thanks for your comment on my margarita love page happy to find another tequila lover. happy weekend! ooh, yes, this sounds perfect. I became quite a tequila fan on our last trip to Mexico… where I used to think of a margarita as a summer drink, I now see it as a year round one! I am enjoying blood oranges and Meyer lemons right now, while I can! These have changed my perspective too…had them again last night. Oh So GOOD! It’s really hard to find blood oranges here in the UK too outside of Whole Foods and speciality markets (depressing because they are available on every streetcorner in Italy and France, it seems! So I grab them when I see them… And so agree on what a difference spending a little more on tequila does make! It is! Someone I met locally today saw it and made them too…her husband was much impressed since she’s never made a cocktail before. Now it sounds like she has a new job. These. I’m getting some more blood oranges today so I can juice them and freeze them for later use since their season is so short. Enjoy! Just made a round of these last night! So happy you found some blood oranges & even happier you posted this drink! This has been my drink of choice for the past month, and I couldn’t agree more about not using triple sec! Is it too early to say I could go for one now?! Once I tried Citronge, I never bought triple sec again. I do something similar to this using pineapple juice, but now I have to try the blood orange version. This looks awesome. That’s my orange liqueur of choice too Tim, though I am thinking of making my own now. I’ve been on a liqueur kick, have Limoncello brewing in the garage so can’t help but think, why not orange? That it is. Much easier than winemaking I think; less variables and less time til done! Totally agree with you on not using triple sec, Grand Marnier is so much better. It’s been a while since I’ve had a good margarita, time to rectify that! Ever since I went to Tunisia I’ve had a soft spot for blood oranges….as for margaritas, well let’s just say I’m a connoisseur, can’t wait to try these. Totally pinning this! I think once you try them you can’t help but love them don’t you think? Thanks for the pin…sure want to share. Wow! You have my attention! What a refreshing site during this dreary Winter. Thank you! Bookmarking this one for Summer guests. They’re gonna love it! I don’t know if you can get blood oranges in summer so I’m getting a bunch his weekend to juice and freeze. It was really THAT good! I know those days. I suffered more when my kids were hurt than I would ever suffer for my self. Hang in there sweetie; grateful it’s the weekend. Monday will look brighter I am sure. Oh yum! Blood orange margaritas are my fave!! Love the fresh lime juice! It’s the only way a margarita should be made! 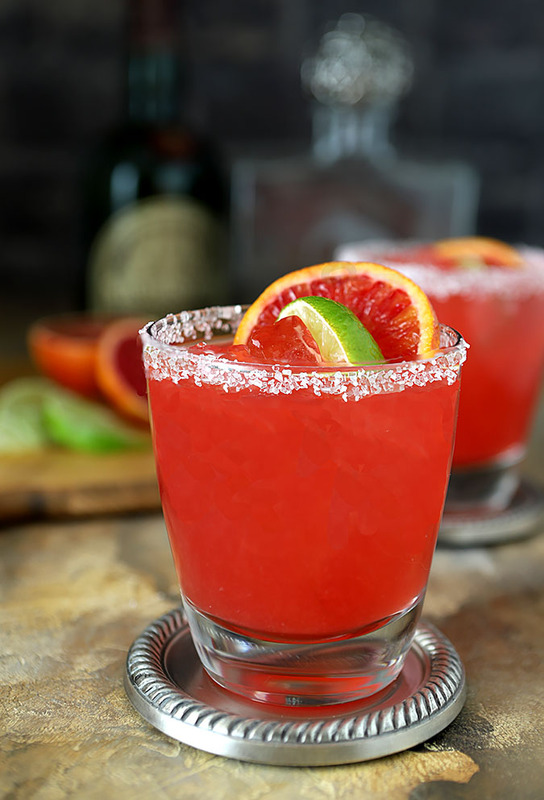 You know I’m a sucker for margaritas… and I have to admit, I’ve never had one made with blood oranges. That is going to have to change immediately. And you’re quite right… good tequila and fresh juice are key! Here’s to the weekend! Clink! I love my ‘normal’ recipe which I’ve been using for years but this was amazing Brian and of course the gorgeousness of the color can’t be beat. I’m off to buy some more, juice them and have a quantity around for a bit. My new fave! Delicious looking cocktail. I’m on a blood orange kick myself. That is SO gorgeous Barbara and just before the weekend starts! Awsm 🙂 btw had no clue that triple sec is just water and sugar. I mean I guess it works OK but I promise you…the difference is noticeable and worth spending a bit more. Yummmy!! I have never made cocktails before – the guy takes care of that and he is pretty good. But I think with this recipe I might just be able to show him I know some pretty good things about cocktails too. Off to buy some blood oranges.. I have everything else! What can I say? Do it…there will be no regrets! So totally Awesome!! Great Recipe! Anytime I can get my hands on some blood oranges, is a perfect day 🙂 I love blood oranges, the colour – the taste … I love everything about it. This is a great margarita, can’t wait to give it a try. It’s ALL about the oranges today Barb!! I LOVE blood oranges (heck, I love anything with citrus!!) and I know this is a killer margarita. Hmmm… making tacos tonight… guess what is gonna go with them?? 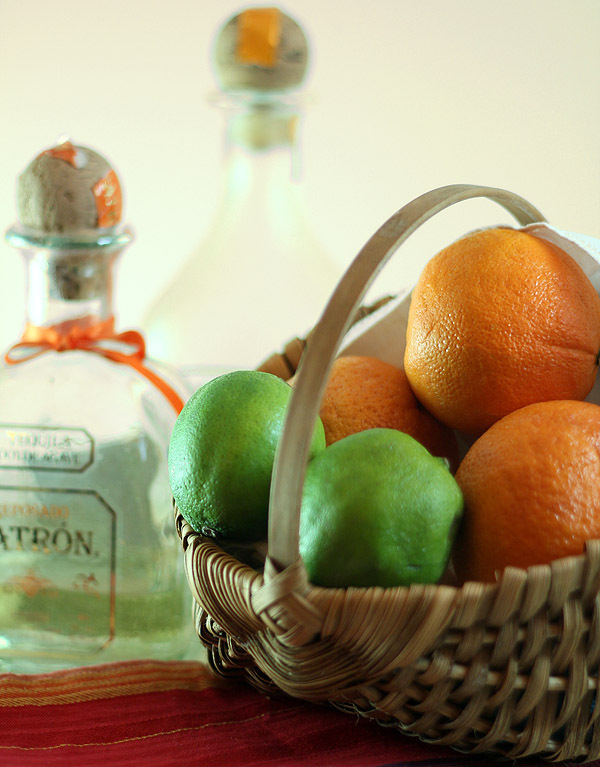 Couldn’t agree with you more on using good tequila, good orange liqueur and fresh citrus!!! They are not something we can find easily but I loved this so much I”m going back to Whole Foods with fingers crossed. I need more! You lucky girl…living in the citrus part of the world. You must make it and then you can make me jealous because I’m not sure I can find more blood oranges. Oh yum….THIS is a margarita! Gorgeous, Barbara. A pretty and fresh note of orange to one of my favorite cocktails! Thanks for the not using Triple Sec advice! Gorgeous margarita dear! Thanks Nelly; come to Colorado and I’ll make one for you. And give you your Wood Butter. Doggone it…guess I have to try that again. So annoying. Oh, now I would have used Triple Sec, being the drink mixer I am ;D You know what? I think the only ‘mixed’ drink I ever made (pouring wine or liqueurs doesn’t count, right?) was pouring a whole bottle of Grey Goose into a split watermelon. Yay for me! 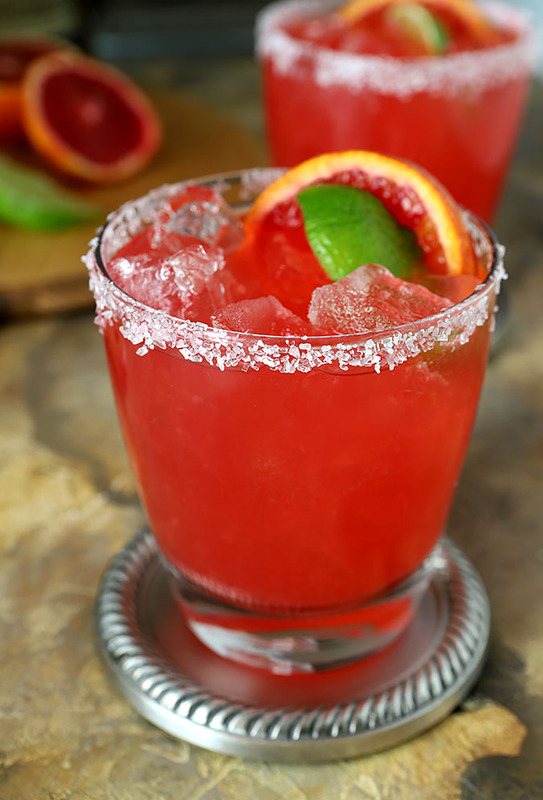 Your margarita is awesome, and I couldn’t agree more about blood oranges – stunning. Do you detect a slight hint of bitter in them when compared to your basic ‘orange’ orange? I went through my google reader this morning and the words “Blood Orange Margarita” jumped from the screen. I knew without looking who made it and more importantly I knew I would be making it soon. Girl, we need to meet one of these days and have drinks. Seriously! Seriously I’m good with that idea. I love that I”m developing a reputation…well, a good one at least…thanks! Truth be told, I’ve never had a margarita and this post is making me want to shovel the snow off the deck, haul out the lawn furniture and get to mixing! Just gorgeous! Well that has to change! Truth is I seldom enjoy ones in a restaurant or bar; either they use inferior ingredients or make them too strong. I love making my own and tailoring them to my tastes. Not that I don’t like potent but this one was almost perfect. Actually a take on a strawberry margarita I’ve also made for years but now, without a doubt, my new favorite. Good lord Barb, this post should come with a warning. It’s not even 9am and now all I can think about is relaxing with one of these in my hand. It’s going to be a loooong day. Then you WILL have something to look forward to Wendi. Probably my favorite I’ve ever made. Just a bonus it’s so pretty. OMG, your photo of that cocktail is SPECTACULAR! Love the colors and props, wow. I have access to a tree here locally that producesand kind of medium blood red orange, has veins of red running through it. I absolutely want to try this when we go picking next week! Thanks so much for posting up. Thanks Wendy…it was a most stellar cocktail. Off soon to hunt down some more blood oranges even. A truly gorgeous cocktail with a lovely blend of flavors, Barb! Though I’m not much of a cocktail drinker – honestly couldn’t tell you the last time I had one – I’m sure I’d enjoy this one. Perfect for the winter season with all its citrus components. Would you believe I don’t drink much by myself. Should I admit I often make a cocktail for the post but beyond a sip or two I pitch it? Not this one…it was sooooooo good. Any day is a good margarita day in my opinion. Please tell me summer is close with the appearance of this gorgeous cocktail on your site because I am ready! You. Me. This and spinach enchiladas? I’m ready.